Located just three miles from some of the best ski trails in New England, the rental is the perfect place for your vacation. Our five bedrooms, four bathrooms house is perfect for the family or the group of friends coming to Stowe for their vacation or special events. From the deck guests can get a beautiful view of Mt. Mansfield. Fully furnished, near Topnotch, Upper Mountain Road location. Just a few minutes drive to the Spruce Peak, the Smugglers Notch pass and Stowe recreation path. Great view and access to the best in Stowe. Visit our website by clicking on the link below. Please contact us for additional rate information. Our rental property includes five bedrooms, four bathrooms, a large living room and a large kitchen with dining area. Each bathroom contains the standard amenities with a toilet and combination tub/shower. The five bedrooms include the bedroom with a king-sized bed, one queen bed, a bedroom with a double bed and two bedrooms each with two single beds. 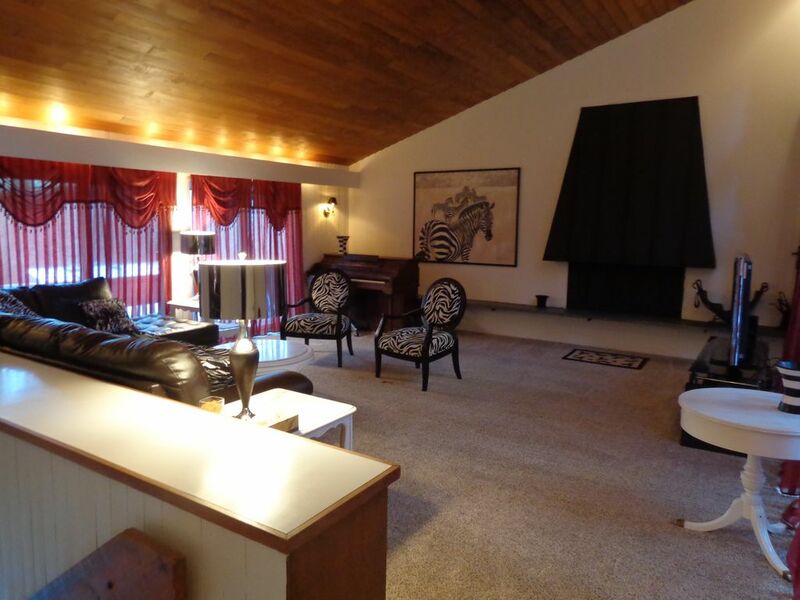 The main living room with cathedral ceiling has a large couch, fireplace and 50 inch HDTV. Vacationers can sit by the fireplace during the winter after skiing/snowboarding on Mt. Mansfield. The kitchen has a stove, dishwasher, large refrigerator, oven, plates, silverware, pots and pans. The outdoor deck in the back includes a large gas grill with an outdoor dining area suitable for four people. The rental can comfortably accommodate from 8 to 10 people. the property was spacious offering 5 bedrooms and 4 bathrooms. Kitchen is very well stocked. Be aware that there is no shower in the master bath. have stayed 2X, beds ,towels, linens, very nice and extra if needed, sleeps 8 easily..
House was everything we imagined! Highly, highly recommend this house for a getaway. My group and I were blown away by how great the house was. There was more than enough space for our group to live here during our stay. The kitchen had all sorts of accommodations. Overall, would definitely recommend this to anyone! Glad you liked your stay. Thank you for your visit and great review! Hope you have a chance to experience other seasons in Stowe! Tons of space in the living area and lots of beds and bathrooms. Large house close to Mtn. House was great size for our family and friends. It was great having all the little things included (paper towels; trash bags; etc). The rooms were good size and fairly up to date. The outside stairs got a lil sketchy in the evenings but nothing that couldn't be fixed with a lil bit of shoveling. The stairs from the entry way upstairs are definitely not kid friendly so just beware of that. Their is no railing and with our two yr old it was a little worry some. Their were baby gates but in the house but just a good thing to know ahead of time. The stove is definitely a lil wonky and takes a lil while to figure out but other than that great house. Owner is super responsive to anything you may need. Only a few min drive to the resort. The road going to the house from 108 is pretty steep. If you don't have 4wd and its snowing or icing it could be pretty tough to get up. Just wish the conditions on the mountain were better while we were there. Close to Stowe Mountain, restaurants and shops. The house provided more than enough space for our family of 10. After figuring out the set up of the rooms we settled in and enjoyed our Christmas dinner and celebration. It’s location is ideal for those who want to enjoy the mountain and everything else Stowe has to offer. Our property is located next to the Stowe Recreational Path and Topnotch Resort (including their world-famous spa and restaurants). We are also less than three miles away from some of the best ski/snowboard slopes in New England. The property is located on a mountain/hill in a quiet location. Renters may feel comfortable to take a free shuttle that goes to the mountain during the winter from the bottom of our hill. Please contact us for monthly and seasonal rates. Note that rates are subject to change until confirmed. Personal checks and credit cards are accepted (Visa, MasterCard and Discover). However, personal checks (including certified checks) are not accepted 2 weeks prior to rental. A $200 security deposit is usually required to reserve the rental.